From spring through early fall, Vancouver USA is in bloom! With so many gardens and farms in the area, we've laid out some must-see spots. As you walk the main path toward Fort Vancouver, your first site is the vibrant garden that borders the Fort. Cultivated with heirloom seeds, the garden is 90% accurate to the time of settlement mid 19th century. The plot is now smaller than the eight-plus acres utilized by the Hudson&apos;s Bay, but still represents the same fruits, vegetables, and flowers. The friendly on-site volunteers who maintain the garden and happy answer any questions about the plants. Located in Woodland, the Hulda Klager Lilac Garden features a collection of lilacs that will take your breath away, especially during the Lilac Days Festival, which spans from late April through early May annually. Just a short drive from the lilac gardens, this farm features some of the best lilies, tulips and irises imported from the Netherlands. 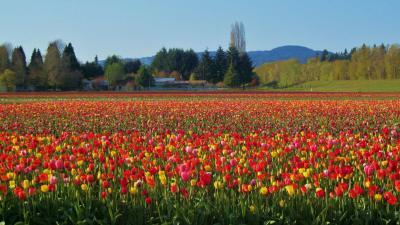 Be sure to schedule a trip during the annual Tulip Festival in April, which is sure to get you in the spirit of spring! With an array of scenic walks and hikes available for anyone, no matter your experience level, you will be surrounded by gorgeous, unique flowers. Over 800 species of wildflowers can be seen, some exclusive to the Gorge area. For the more dedicated enthusiasts, various guided flower tours are offered by local experts. Just let us know you are interested and we can help arrange the tour that best suits your interests! The Raintree Nursery alone makes the scenic drive to Morton, Washington, worth it. The world-famous supplier of fruit trees, unusual edibles and ornaments attract visitors from near and far. Located in a quiet mountain setting, the nursery also features a café and gift shop and is open daily.